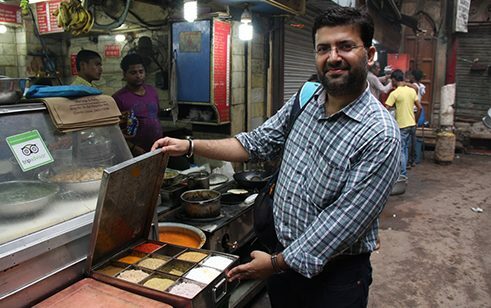 A culinary stroll through Old Delhi with Anubhav Sapra is an adventure for your taste buds. It is early morning and the street food vendors are already getting down to their fiendishly fiery business. The poor reputation of Indian street food extends far beyond the subcontinent. There is not a guidebook that does not warn you against eating on the streets. Should you nevertheless do so, you risk spending valuable days of your vacation in the hotel, very close to the toilet. Given the poor hygienic conditions, many Indians too avoid street stalls and snack bars. Sapra, on the other hand, is attracted to the stalls like magic. The 31-year-old began his culinary journey of discovery through Delhi 15 years ago, when he left Bihar, a state far from Delhi, to come to the capital to finish his schooling and to study political science. He had barely arrived but had already started missing his mother’s beans and rice. Sapra began to wander through Old and New Delhi in search of good, home-style cooking. He discovered that among those cooking on the streets, there is many a chef in disguise. Sapra started a blog in which he wrote about his culinary adventures under open skies. In 2011, he called all those whose curiosity had been aroused to accompany him on his gorging expeditions. Thirty people came – a business idea had been born. 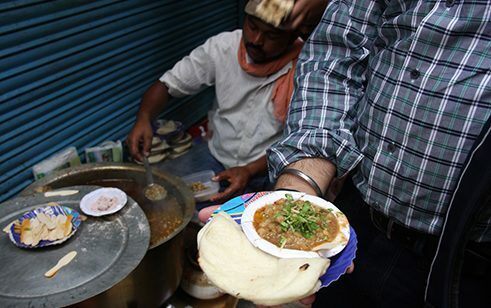 Today, Sapra offers Delhi Food Walks in the mornings and evenings, for groups or tailor-made for individuals. He continues to be the guide for all the tours. ‘One sees it,’ he says, glancing at his waist. At 8 in the morning, Old Delhi still belongs to its residents. The bazaars, which attract hundreds of thousands of people into the lanes during the day, are yet to open. But there is a bustle: because the people here live in tiny flats, life takes place on the pavements that are still empty. Neighbours are chatting, women are washing saris and children. Men are having a shave on the street; in front of the temple, vendors are stringing orange marigolds into garlands. Streetfood... | Photo: © Ulrike Putz The hungry are already standing outside Shyam Sweets Shop – as they have been doing since 1910. The shop is known for its nagori halwa: a hollow ball of dough, puffed out like an egg, in which the customer makes a hole with the fingers and fills it with a mass of semolina, sugar and spices. A good start to the day for Sapra, a professed lover of the sweetest of sweet. He uses a hand sanitizer – just in case – before tucking in. In a jiffy, the sugary morsel has been consumed. We continue through alleys that become narrower and narrower. The destination is a small crowd of people: on one square metre of pavement, in front of the metal roller shutters of a stationery shop, resides Deepak Lotan Cholewalla, lotan, the chickpea man. Deepak, the great grandson of the first lotan who cooked the first pot of soup 97 years ago flamboyantly pours chickpea curry into a small cardboard bowl. Topped with red chilli sauce, ginger and coriander, a piece of flat bread: heavenly. And fiendishly spicy. Deepak does not want to reveal how many helpings of the curry he sells per day, but the melee around his pot speaks volumes. ‘The family apparently makes two to three lakhs per months,’ murmurs a customer. Up to EUR 3,800 ­– a fortune in India. You follow your nose to find what is supposedly the best sweet shop in the city: a heavy smell of hot milk and butter wafts across the street. Chaina Ram Sindi produces all kinds of toffee: with nuts or plain, hard or soft, with cardamom or lemon. To soothe the tongue after so much sugar, Sapra, to wrap things up, still has a hearty dish in store. Once again it is chickpeas with bread, but these peas are floating in a thick, dark sauce, not in a broth. Although the ingredients are similar, the difference between the dishes is as great as between chicken soup and coq au vin. Sapra enjoys seeing the puzzled faces. It is the art of Indian cooks, he claims, to keep reinterpreting simple ingredients – chickpeas, potatoes, chicken – with the help of spices. Tourists who are not brave enough to try out genuine Indian food, have not experienced India, he says. Delhi Food Walks: A three-hour breakfast walk through Old Delhi costs around EUR 35 per person, inclusive of food, water and hand sanitizer. Ulrike Putz is South Asia Correspondent at SPIEGEL ONLINE. She lives in New Delhi.